The term ‘renal failure’ means failure of renal excretory function due to depression of GFR. This is accompanied to a variable extent by failure of erythropoietin production , vitamin D hydroxylation, regulation of acid-base balance, and regulation of salt and water balance and blood pressure . ‘Acute renal failure’ means a decrease in renal function lasting days or weeks, whereas ‘chronic renal failure’ means renal failure lasting months or years. Acute renal failure is more likely than chronic renal failure to be reversible, depending on the cause. Chronic renal failure is often progressive, whatever the cause. Acute renal failure may cause sudden, life-threatening biochemical disturbances and is a medical emergency. The distinction between acute and chronic renal failure is therefore important in the initial management of a patient presenting with uraemia. Clinical features are often non-specific. This may be (i) pre renal, (ii) renal or (iii) postrenal. This distinction is useful in generating a logical approach to a patient with renal disease, but it is important to remember that more than one category of cause may be present in an individual patient. 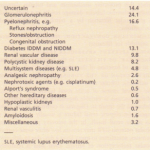 Other causes of altered serum urea and creatinine concentrations are shown. Failure of perfusion with blood of the kidneys is present in pre-renal failure. This results either from hypovolaemia and hypotension or from impaired cardiac pump efficiency or both. Normally the kidney is able to maintain glomerular filtration close to normal despite wide variations in renal perfusion pressure and volumestatus-so- called ‘autoregulation’. Maintenance of a normal GFR in the face of decreased systemic pressure depends on the intrarenal production of prostaglandins and angiotensin II. Increased sodium and water reabsorption in response to sympathetic stimulation, aldosterone and vasopressin lead to decreased urine flow which results in decreased urea clearance, even when GFR is preserved. This leads to an elevated blood urea and urea: creatinine ratio. Further depression of renal perfusion leads to a drop in glomerular filtration, termed prerenal failure. 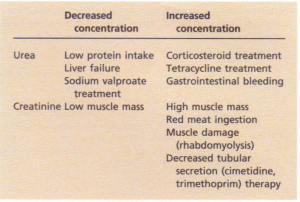 concentrations other than altered renal function. 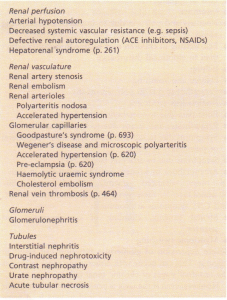 Drugs which impair renal autoregulation, such as ACE inhibitors and NSAIDs, increase the risk of prerenal failure in hypovolaemia. By definition, renal function in prerenal failure returns to normal completely once normal renal perfusion has been restored. 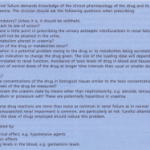 A number of criteria have been proposed to differentiate between prerenal and intrinsic renal causes of renal failure; laboratory tests however are no substitute for careful clinical assessment. If hypovolaemia or hypotension are present, these should be corrected whether the renal failure is prerenal or intrinsic in origin; failure to do so may prolong the course of intrinsic renal disease. The criteria suggested rely on the fact that renal tubular function is intact in prerenal states; in particular, sodium and water reabsorption, both of which should be maximal in hypovolaemia. URINE SPECIFIC GRAVITY AND URINE OSMOLALITY are easily obtained parameters of concentrating ability but are unreliable in the presence of glycosuria or other osmotically active substances in the urine. Interpretation of these measurements also depends critically on the clinical context. Dilute urine may be a perfectly normal response to water overload, for instance. 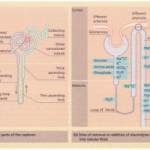 URINE SODIUM is low if there is avid tubular reabsorption, but may be increased by diuretics or dopamine. FRACTIONAL EXCRETION OF SODIUM (FENa), the ratio of sodium clearance to creatinine clearance, increases the reliability of this index but may remain low in some ‘intrinsic’ renal diseases, including contrast nephropathy and myoglobinuria. 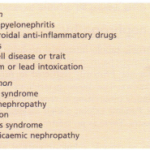 intrinsic causes of renal dysfunction. Given that normal renal function requires arterial and venous blood supply, normal glomeruli and normal tubules, it is not surprising that a large range of diseases may cause acute renal failure. OBSTRUCTION OF THE TUBULE by debris shed from ischaemic tubular cells. 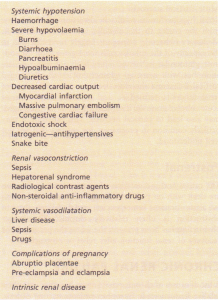 Causes of acute renal failure. Some causes of acute tubular necrosis. The clinical course of acute renal failure due to acute tubular necrosis is variable depending on how severe or prolonged the insult is. Oliguria is common in the early stages; non-oliguric renal failure is usually a result of a less severe renal insult. In the recovery phase of acute tubular necrosis GFR may remain low while urine output increases, sometimes to many litres a day, due to defective tubular reabsorption of filtrate. Even after a relatively short-lived insult acute tubular necrosis may last for up to 6 weeks. Eventually, renal function usually returns towards normal. The outcome is critically dependent on the severity and reversibility of the underlying cause andon age. Renal hypo perfusion results in diversion of blood flow from the cortex to the medulla, with a drop in GFR. Medullary ischaemic damage is largely reversible due to the capacity of the tubular cells for regeneration. In contrast, glomerular ischaemic injury heals not with regeneration but with scarring-glomerulosclerosis. Prolonged cortical ischaemia therefore leads to irreversible loss of renal function, termed cortical necrosis. Any cause of acute tubular necrosis, if sufficiently severe or prolonged, may also lead to cortical necrosis. This outcome is particularly common in pregnancy, for reasons that are not well understood. The causes and presentation of urinary tract obstruction are dealt with. Although patients may present as acute uraemic emergencies, renal failure due to obstruction is often relatively chronic. The longer obstruction has been present, the worse the prognosis for recovery of renal function after relief of obstruction.